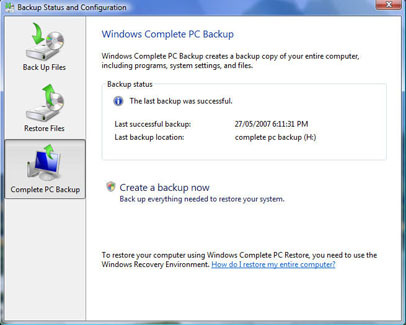 Windows Complete PC Backup is a completely new addition to Windows Vista, but is only available in Windows Vista Business, Enterprise, and Ultimate editions. This option is not available in Home Basic or Home Premium editions. The object of Complete PC Backup is to completely image your hard drive, including operating system, installed programs, settings and data files, so that you have an adequate backup just in case of a fatal system failure. While the compression ratio in Complete PC Backup is somewhat lower than, say, Acronis True Image or other imaging applications, Complete PC Backup is, as I've said, free with Windows Vista Business, Enterprise and Ultimate and is well worth making use of. Like most imaging software Complete PC Backup is wizard based, so you should have no problem creating an image of your current hard drive. To start the imaging process just Click the Start button followed by All Programs then navigate to Accessories, System Tools and, finally, Click on the Backup Status and Configuration option (see fig:1). 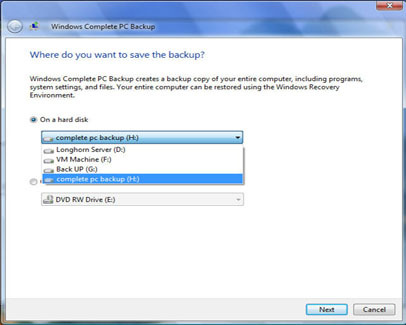 After Clicking the Complete PC Backup option another window will appear. This is the start of the Complete PC Backup wizard. 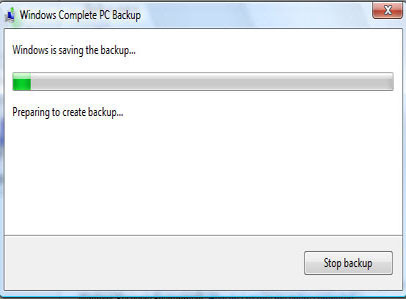 To get the whole process started, Click on the Create a back up now option (fig:3). 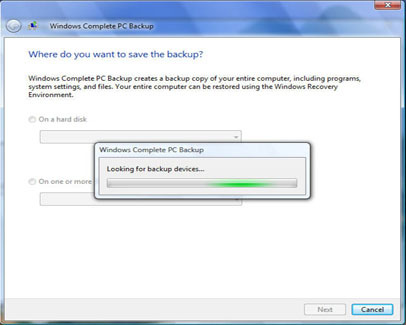 Once you have Clicked on the Create a back up now option another window will appear. This asks Where do you want to save the backup. At first you will not be able to do anything within this window as the application will be busy trying to locate any backup devices (fig:4). From the above window, select the destination for your hard drive back up. If you have more than one hard drive, you can select the drive you want to back up to by clicking the arrow to the right of the on hard disk dialogue box. (see fig: 6). As well as showing any additional hard drives the screen, shown in figure 6, will also display any available partitions on that hard drive. If you don't wish to use your hard drive or a removable hard drive for storing the back up copy of your system, you can choose to have the data copied to DVDs instead. How many DVDs you will require will, ultimately, depend upon the amount of information that has to be imaged. 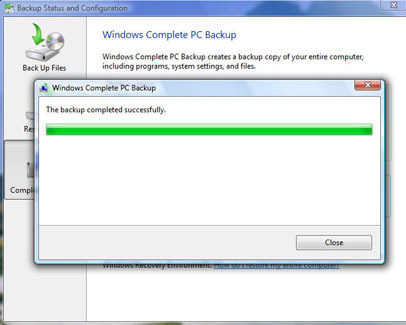 Complete PC Backup will indicate and approximate amount of DVDs need to accomplish the task. Like most things in life, though, the required DVDs will only be an 'approximation,' so make sure you have some spare DVDs to hand, just in case. You should also ensure that you number each DVD as they are created. Failure to do so could result in you not being able to insert the DVDs in the correct sequence when you eventually need to restore your system. 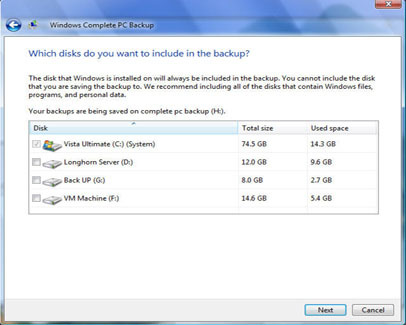 Once you have decided upon the destination for your back up you then get to choose which disk(s) you would like to create a backup of (fig:7). You select the disk(s) you want to image by placing a check mark in the box to the left of the relevant disk(s) information. 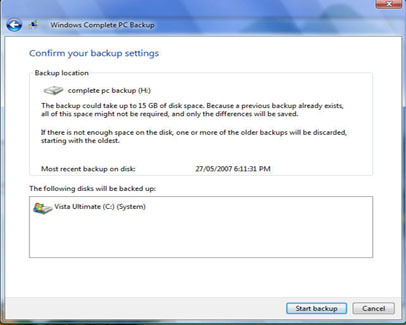 After selecting the disk(s) you wish to image you will need to confirm your backup settings (fig:8). 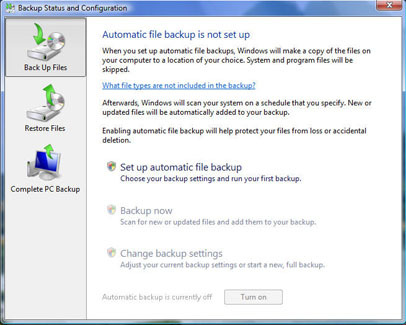 After you have checked that your back up settings are correct, Click the Start backup button. The back up process will now begin. How long this will take will depend upon how much data has to be transferred. You can monitor the progress of the back up by checking the progress bar (fig:9). 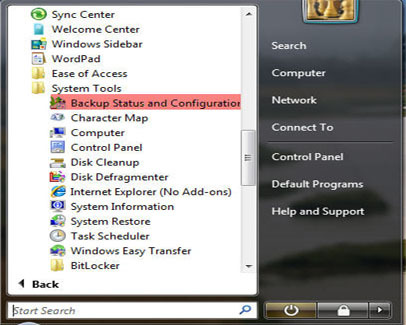 If it becomes necessary to stop the back up at any stage, simply click the Stop backup button and the back up will not continue. Your back up data is important so make sure you store it safely. This is particularly true if you back up to a removable hard drive or a set of DVDs. 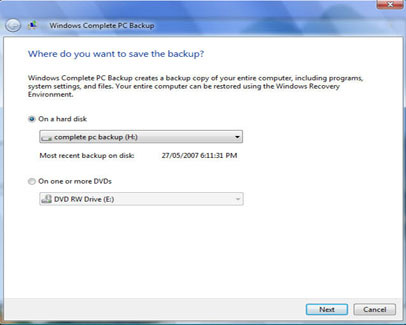 To restore your back up you will need to use the System recovery options menu available on the Vista DVD. If you do not have the Vista DVD, for example your PC came pre-installed with Vista, then the PC manufacturer should have made provisions to access the system recovery options via a menu at start up. For more details on how to access the System recovery options when your copy of Vista came pre-installed, see your computer's user guide.